Yo anyone still play SWTOR and want to hook up? They recently released a DLC, actually. Everytime I download it on a computer, it kind of messes things up. I've gotten back into SWTOR. I'm now Lv. 44 (I left off at Lv. 16), bought a stronghold, and lots of mounts and pets. Also, a couple friends and I opened a SWTOR PM, if anyone eants in. Just got back into playing it as well. Left off at lvl 23 for my Bounty Hunter, and I'm not at lvl 44. I'm completely in love with the Bounty Hunter story. which Class story is your guys favorite? because i have seen some people say that the imperial spy story is the best story if all the 8 classes in the game. also i have played the game for a while and i also desited to make a new batch of 8 characters. because i grew bored with the old ones and wanted to have a fresh start with the game again. and my first one was with the sith sorceress, who i tried to make evil, but one who is smart enought to see how bad a desition would hurt the empire, only for me to go with many light side choises because all of the light side choises seems much smarter and do the empire more good than the evil ones. I started a Female Miraluka Knight for the DvL event. Knight's gameplay is pretty fun so far, I think I prefer the Focus bar more than the other "mana" bars in the game. Yep. Not much info besides the name. 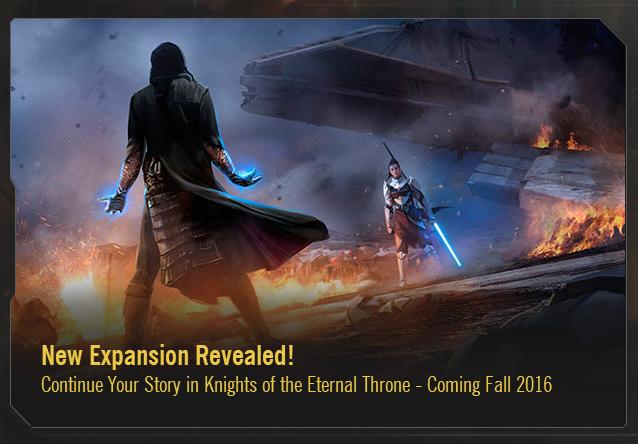 "Knights of the Eternal Throne". It'll be out later this winter. It's almost guaranteed to be a KotFE sequel. I heard about this game an i'm downloading it today. Does anyone else still play it and wants to group? Oh, a couple friends and I have a PM here. If you want, I can add you in and show you the ropes once the download's finished. If you want, I can add you in and show you the ropes once the download's finished. Cool! It would be great to have someone to show me the ropes. Oooh, saberstaffs, cool! You don't see those very often. *Lightpikes, the term saberstaff is synonymous with double-saber. I hope light-whips show up at some point. Whoops, I had a feeling I was off. Serves me right for not looking it up.